"Export normals" defaults to true and the screenshot of my settings that I posted above had it set to true, but that could very well have been the answer. I just gave exporting the .obj another shot, paying particular attention to that setting, and this time it worked correctly. The previous .obj *does* have normals in it, though. Perhaps for whatever reason the model's normals were flipped when I exported it the first time? I did tinker with the .blend file a bit more in the interim so I may have fixed the normals by mistake. Hey Guys can you help me with this, it appears I install the ships but I can't see them, i don't know what im doing wrong. Don't you just put the given named folders and match where they go? the pak file is just a renamed zip file containing the objects, textures or models or whatever is needed to load the ship. - import in blender the .dae and export as wavefront (.obj) with options as previously shown in this thread. 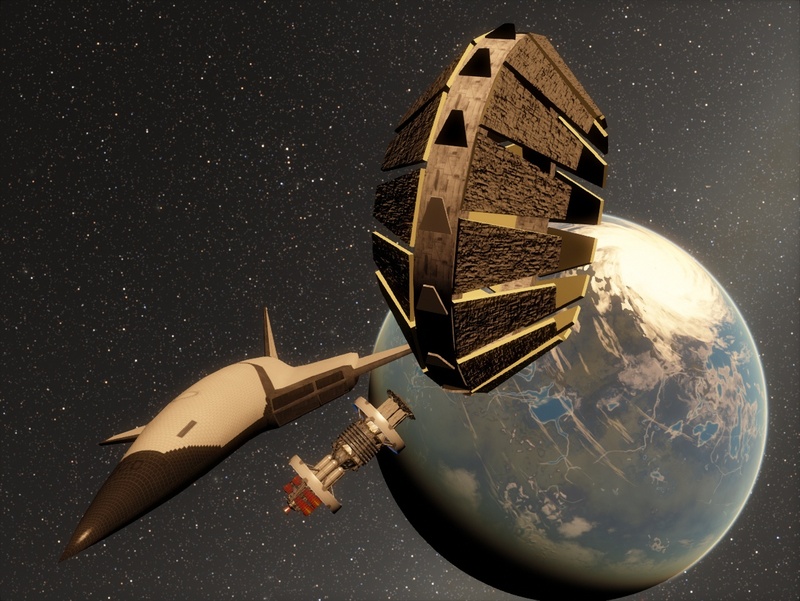 - put .mtl in textures/spacecraft and .obj in models/spacecraft and create a simple .sss file. - Open SE and build the object which create .sml .cfg and .sm files. - modify created .sml and .cfg as needed to point at right textures. After a bit of trial and error I got what I wanted. in the new update i notice that there is no .mtl files. why? A few?? I'm afraid I don't have much time. Do you have trouble exporting .3ds to .obj with blender? Quick question with using offset if I want the very backside of a ship to be the landing point where I stop above a planet to a stand still and let its gravity pull me in then prograde so it falls backwards into the planet which of the (0 0 0 0) would I set so the end of the ship stops on contact instead of default middle of the ship with the back half being eaten up by the hungry surface? Sorry had to read a couple times. When you need to move or rotate some modules or even the entire ship, use the SE integrated ship editor, which will let you change those parameters from GUI (Shift-F2 when the ship is selected). field in the .sss file where you set the depth of the ships contact point to a surface. default is middle of ship mass. I wouldn't change manually those parameters unless my life would depend on it The editor I mentioned it's made precisely for that. You will see the effects of your translations/rotations on the model, and when you're satisfied you can save the results. For my modded habitats I tweaked every module with that editor. This is too hard to understand for me. What I have understand, is what you are thinking what Offset parameter controls collision detection. You are wrong. It controls location of the ship's center of mass. Collision detection always work as is ship is a ball of a radius of 1/8 of the Length (another parameter in the sss file). Yes, I know, physics engine in SE is crappy, but you can't do anything with it. Yes you may change Offset so collision will look more naturally, if you'll attempt to land normally. But if not, you ship may go underground completely. Also, center of mass is used to rotate camera around ship (with right mouse button, or automatic smooth camera), so with it shifted, rotation will look weird.